Fries don’t just pertain to potatoes anymore! 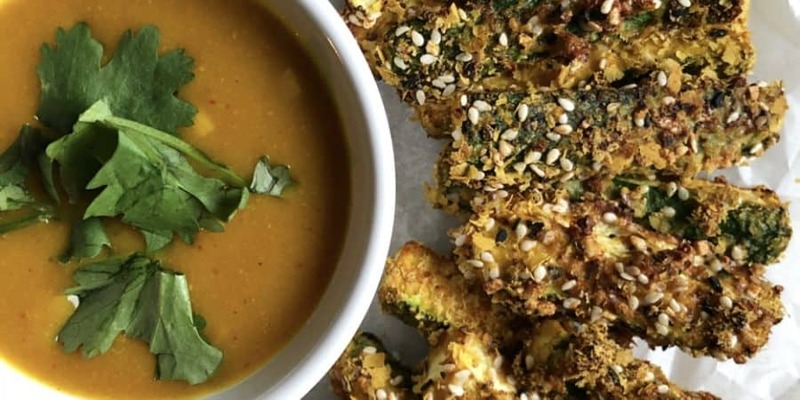 You got carrot fries, zucchini fries, yucca fries and so much more! Also, I know the word fries has fry in it but you can bake your fries to crisp deliciousness too!! 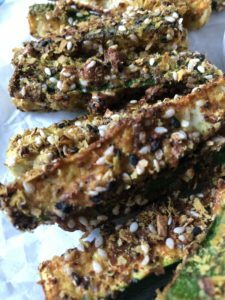 To be healthier, use an alternative to potato just like I did here with zucchini and bake rather than fry; those little tweaks will make a big difference with your health in the long run. Plus, fries foods always make us feel bloated and icky after; this will taste delicious and remain light on your tummy. I also make this recipe dairy and gluten free for those with dietary restrictions like myself. I hope you try it out for yourself! In a bowl, add the beaten egg and paprika. In another bowl, add the rest of the ingredients. 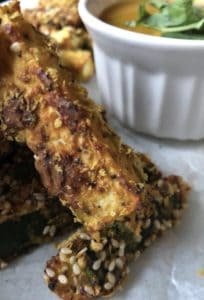 Dip the zucchini pieces into the egg wash and then into the nutritional yeast (or Parmesan) mixture. Place on the baking sheet. Make sure not to overcrowd the pan or the fries will not crisp up. Place in the preheated oven and bake for 15-20 minutes. Take it out of the oven and let it cool a little bit before enjoying with your favorite dipping sauce.